Roughly a week ago the winter arrived here in the Netherlands! I was already bit sceptic whether that would happen because we had few weeks ago still crocus' growing outside. On Friday it started to snow which meant also interesting trip from getting back home from work. Especially after reading the news from Helsinki where there had been a real snow chaos. The ride home went without problems although I started to doubt severely whether the "winter tires" are in reality some kind of "let's skid in the snow" tires. Luckily this country also knows a bit about winter sports! Without any mountains or open wide areas skiing and long-distance skiing are not really options, but skating is very popular. Some weeks ago I noticed that somebody had flooded the field close to us. That of course meant that there is soon going to be a skating rink! Today we went out to test it, with a nice sunny and -5c weather. Sometimes - like today - I miss a country which is 8 times as big in geographical size but has 1/3 of the population of the Netherlands. It was quite busy! However, the ice was very nice despite being on a grass field and it was also very cheap (15 eur for a family season card). 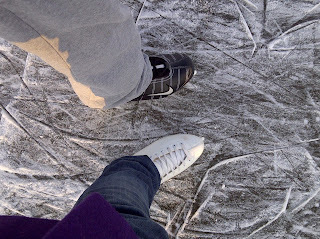 After few slightly chaotic events for getting the ticket and getting the skates on we were finally on the ice. The way it works here is that people skate counter-clockwise around the area. I've mainly used to the big round skating rinks where you can basically skate to where ever you want. I soon understood that would not work here at all. In practise the ice was full of people, some with skates, some without. First of all we needed to get through a wall of people and then choose one of the three lanes. I know the problem is just tussen mijn oren (between my ears), but I was still amazed that one guy managed to pass us while saying to another person "it is so nice and quiet here today". Say what?!? One reason for the not-so-crowded skating fields in Helsinki (capital of Finland) might be that we have around 60 places/parks/sporting fields etc to choose from. In addition numerous privately managed small skating fields. The only problem is that with occasional -25 degrees Celcius, this winter sport is a bit too "sportive" outdoors - but then we can skate indoors!